We really love beans and rice……rice and beans. And it’s not because they’re cheap either. We just really love beans…..and rice. It’s just a nice perk that they’re cheaper than meat. We have beans at least one night per week and sometimes more than that. If you eat here, more than likely you’ll have beans or pasta. Wanna come to dinner? 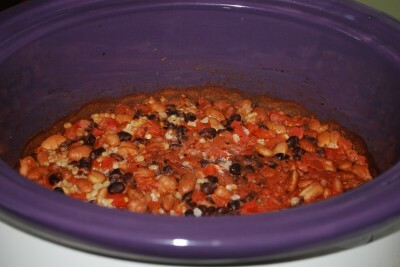 I attempted to set out and create my own beans and rice recipe just for the crock pot……and the result was good. There were a few changes I’ll make next time, but I’ll note those for you. I mess up a lot – so therefore I make lots of recipe notes. It’s how I roll. You’ll need cooked beans (I used a combo of black beans and pinto beans), brown rice, cumin, diced tomatoes, butter, salt, and garlic powder. I used canned tomatoes, but you could substitute 1 ½ cups of chopped fresh tomatoes if you like. My tomato plant isn’t really producing many tomatoes. But we’ve prayed for it…..so maybe that will help. Maybe it would also help if I wouldn’t look directly at the tomato plant since I tend to kill them. Rinse and drain the beans you’re using. My beans were pulled from the freezer. They were leftovers from a big batch I made in the crock pot. Rinsing them helps with gas…..or so they say. I’m a skeptic. I used short grain brown rice, but you can use whatever you like. Pour the rice in your crock and pour melted butter over top. Stir it together so the rice is nice and coated. Butter makes rice magical. I am happy with a big plate of rice with just salt and butter. Oooooooooooooooooh baby! Add the beans and tomatoes. Make sure you have NOT drained the can of tomatoes. We really need that liquid. If you’re using fresh tomatoes you might need to add more water than specified. I added 1 ½ cups of water. In hindsight I should have added more water. Next time I’ll add 2 cups. The end result was great but not as moist as I like it. Moist is just a weird word. Now, add your cumin, garlic powder, and salt. If you really want HOT beans then you can add cayenne pepper or hot sauce during this step. I like hot food, but I’m trying to introduce it to Annie gradually. If your nose isn’t running, it’s not hot enough – that’s my general rule. You could also add a can of diced green chilies. Stir it all together well, put the lid on, and turn it on to high. Yes, high. Normally I cook at low, but I only had 3 hours before dinner was supposed to be ready – so I wanted to make sure the rice was done. Mine cooked for 3 hours. Barry said they were really done (I was at a workshop), so it might even be done after 2 ½ hours. It depends on the type of rice you use. So, I would check it after 2 hours and then cook accordingly. There ya have it! They are very tasty….but then again, I just love beans and rice. You can serve hot sauce on the side if you like a challenge. The leftovers are pretty good……but a tad bit dry. Rice and pasta soak up moisture when you put them in the fridge. So, I plopped salsa on top of the leftovers and they were delicious. Annie LOVES them. We love beans and rice – have I mentioned that? Crock on! 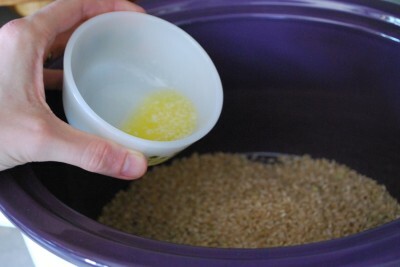 Combine rice and butter in the crock pot. 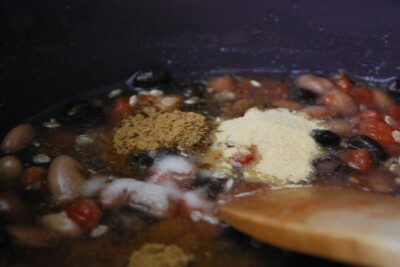 Put remaining ingredients and beans into crock. Stir well. Cover and cook on high for 2-3 hours. Begin checking at 2 to 2 ½ hours to see if your rice is done. Love this recipe!! Great side with tacos. Yum! Thanks for the comment, Charlene! Thank you! Your recipe was just what I was looking for. I have had my beans cooking already and wanted to add brown rice to the pot. Most recipes say cook white rice separately but I want it to cook all together. Just wasn’t quite sure when to put it in. I’ll follow your recipe from the time you add the rice. Thanks again. Julie I’m a truck driver I was thinking of making this for dinner tonight but all I have is mixed dried beans and white rice. It might just be done for a breakfast time I will let you know how well it turned out. How well would this translate to an instant pot? I never remember to start cooking early enough for the crock pot! Hi Ashley. 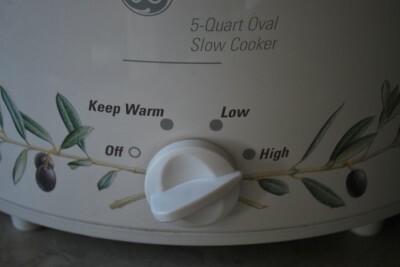 If I were converting this to the Instant Pot, I would cook the rice in the Instant Pot first for about 25 minutes, using a 1 to 1 ratio rice to water instead of the 3 cups the recipe calls for. Then I would stir in the beans, butter and spices and let it sit until all the ingredients have warmed up. Soundes easier than i was making it out to be. Thans so much!!! I want to try this recipe. 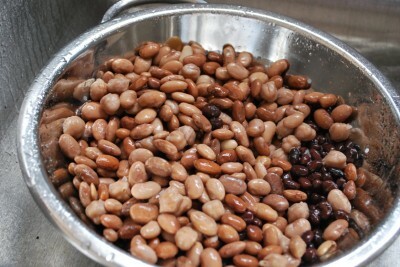 How would you do this if your beans are not cooked?. cook beans half way then add rice? 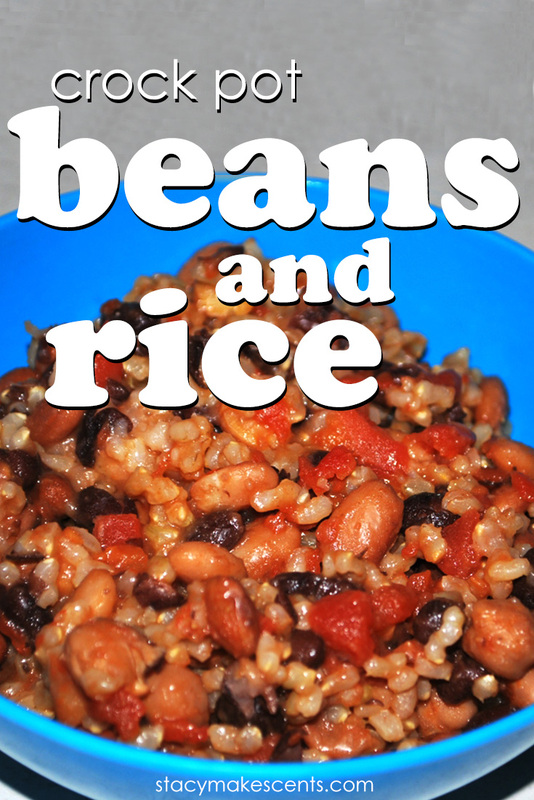 It might be a little bit of a guessing game…beans can take a while to cook while rice is quicker. I would try to make the beans in advance – maybe the day before. I’m guessing canned beans would work for this as well? Absolutely! You’ll need about two cans, drained. I’ve had fun reading through LOTS of your posts over the last day! A THM blogger had linked to this recipe, and then I looked at A LOT of your organizing Kon-Mari (sp?) style – it’s Saturday morning and I’ve taken care of three of our clothing drawers! (I’m hold #32 at our library – but we have 10 copies, so hopefully it won’t take too long!) Thanks for sharing all that you do! Now, back to THIS post – have you ever doubled it? Or do you think it would double okay? Just don’t want the rice to not cook, but we’d need it doubled. 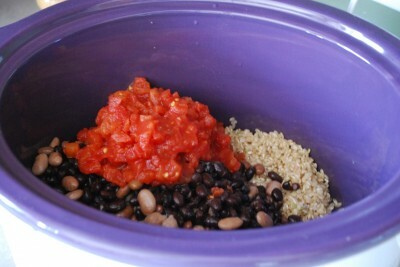 =) Also, with the beans in the crock, do you do just one pound at a time, or will two fit in the crock? Thanks in advance! Curious as to how many this serves at the 1 1/2 cup servings for an E meal? I haven’t ever measured it out. So, am I correct that you’re using pre-cooked beans but RAW brown rice? And the beans don’t totally turn to mush after all that extra cooking? Honestly – I buy mine in bulk from the Amish store and it just says “Brown Rice.” 🙂 You can always cook it longer until it’s the texture you desire. I almost always list the lesser amount of time because crock pots always cook at different temps. I used chricken broth instead of water and butter. Very flavorful and yummy!!! Stacy, making this as we speak. It’s been 3 hrs on high and rice is still as hard as when I put it in there. Help! I have found there seems to be no rhyme or reason for rice – sometimes it just takes a long time. 🙁 I have to say I’ve never had rice hard after three hours on high…mine always turns to mush. Rice is so fickle sometimes. 🙁 Did it turn out okay? Love this recipe! Could you, would you give an approx measurement for salt? I always underestimate. Salt is such a personal taste thing – I like way more salt than most people. 🙂 Just add a dab and taste until it’s right. This sounds fantastic. Can I freeze any left overs? I just have to say—I have said for years that “moist” is a really weird word (along with “wound.”) I feel like we might be secretly related. 1.) Baked oatmeal in ramekins (enough said) and 2.) Moist?!?! It’s an awfully big coincidence! 🙂 Love your blog, Stacy! Shew. I hate that word. What size crock pot did you use? I’d like to adapt this recipe for my 2 quart crock pot. Thanks. Looks really yummy. I have a 2 quart crock pot. It is full and you need to stir it carefully. Made this again today (second time in two weeks) and it’s crazy yummy again! One of my new favorites! I do love me some beans and rice! Could you could this on low? If so, how many hours would you recommend? Usually low is double the amount. How many people will this recipe feed? Up to 10? No. It won’t feed 10 as a main dish. Maybe as a side. Thanks! I doubled it today 🙂 I made it before a while back and didn’t get the rice done enough, but it was still good, lol. Cooking longer today! Hope it turned out fabulously! Made this for lunch yesterday. It was amazing! When having this as an E meal do you add a protein (a meat) or is there enough protein in the beans and rice alone? I just wanted to comment on your skepticism on rinsing the beans. I am currently a culinary student and my teacher elaborated on the gassiness of beans. 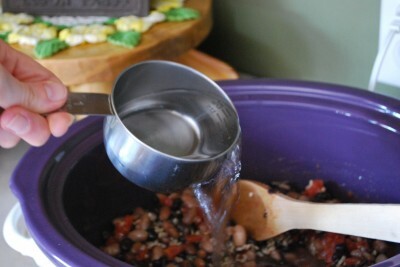 She recommended rinsing the beans right after the initial cooking of them, then before you use them again rinse them once more and then bring them to a boil once more to activate the beans and then rinse them once more. If you do this you will have no gassiness. It is crazy! We were all shocked when she made refried beans for us and we all commented on how quiet the next day of class was. We thought that it was hilarious because it is such a little thing. Wow! That’s great information! 🙂 Thanks for PASSING it along. HA! Is beans and rice the main dish? if so what do you serve with it? Yes, it’s the main dish…but it could also be a side. 🙂 I usually serve it with a salad. this sounds yummy – can’t wait to try it! btw, you inspired my dinner tonight. 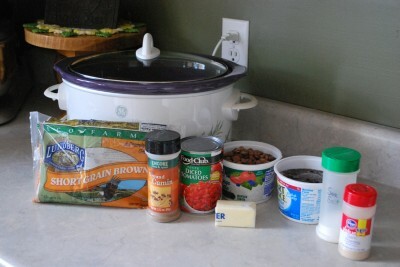 I made my own version of beans, beef and rice using “crock-pot” beans from my freezer. I’m cooking them on the stove because I only had 2 hours until dinner, the smell is making me even hungrier!! I can’t have butter, it ok to eliminate or maybe use a little olive oil?